Manvar Resorts, situated on the highway between Jodhpur and Jaisalmer, is a beautiful desert resort that you cannot miss out on on your next trip to Rajasthan. You get to stay like royalty in tents and all, and honestly, we’re loving the sound of it already. 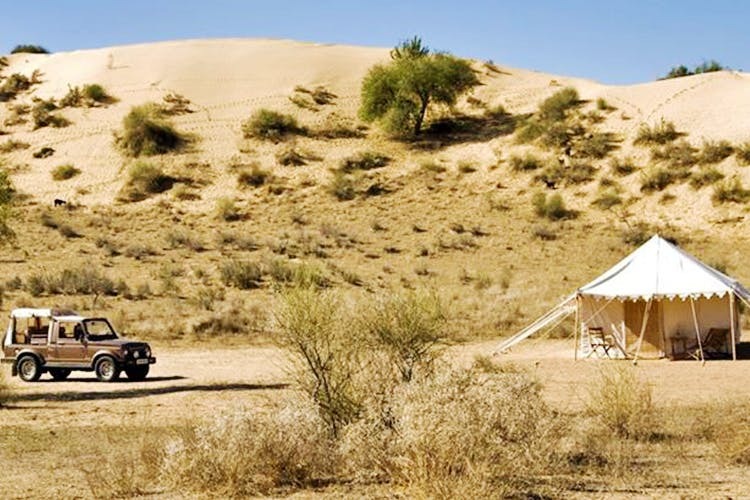 Their whole idea is to stay away from civilisation and enjoy the charm of Rajasthan where it’s meant to be enjoyed, which is literally in the middle of the desert, with well-laid-out tents strategically placed for breathtaking views. You can choose to stay in the resort or out in the camps about 7 kms away from the resort. Wherever you choose to spend your time, it’s surely going to be worth your while, though we like the camps better. You stay in perfect seclusion and away from all the hustle bustle of the cities; we say experience Rajasthan the way it’s meant for a change. They also organise various activities in and around the camp, like camel rides, desert excursions and themed dinners. They have different types of accommodations available depending on how much you’re willing to shell out. The standard rooms are perfect if you’re looking to not spend much yet enjoy the comforts of the camp.